Inscriptions: u.r. handwritten in ink: "6"; u.l. handwritten in ink: "run 5 + 6 on same piece of paper"; u.l. handwritten in ink: "23 / 35"; c. handwritten in ink: "ignore [...]"; l.l. handwritten in ink: "enlarge m to fit in top MAGIK [sic] to reach from side to side picture (with magic words inserted) to fit in bottom"; l.r. handwritten in ink: "print blue except where stuff goes over - drop out M + picture + parts of magic"; verso, u.r. handwritten in pencil: "5 + 6"
"Untitled." Corita Kent in the Grunwald Center Collection. 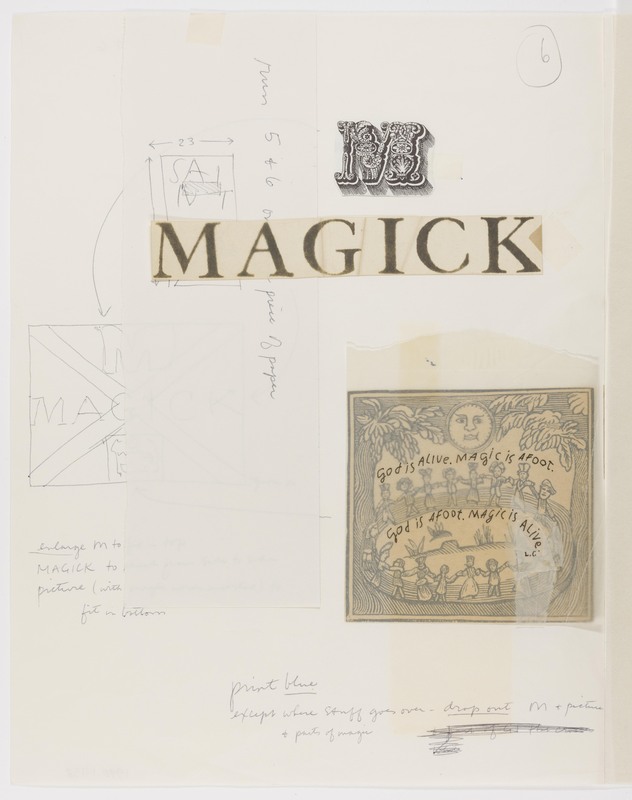 Los Angeles: Hammer Museum, 2017. https://​hammer.ucla.edu/​collections/​grunwald-center-collection/​corita-kent/​art/​untitled-preparatory-material-for-m-is-for-magick/​.